Whether you’re planning a Wine Country wedding at a nearby vineyard, a family reunion or other small gathering, the Napa Valley Lodge is the perfect boutique Yountville hotel for your group room block. Not only is the Napa Valley Lodge one of the region’s best loved hotels, it offers one of Northern California’s most extraordinary values. Your group stay will be highlighted by our signature complimentary amenities, including daily Champagne continental breakfast buffet, afternoon tea and cookies, and Wine Hour on Thursday and Friday evenings. 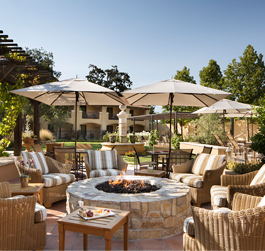 During their “down time,” your guests can enjoy all the amenities of our beautiful Yountville hotel, including a heated outdoor pool and whirlpool spa, a bocce ball court and a cozy courtyard fire pit. The Napa Valley Lodge has the professionalism and experience to help make your event successful and one to remember. Please contact us using the button below, so we can tailor a great experience for you and your group!